“Suggest a Joint” has hit again, and this time with a vengeance as my inbox was flooded with emails telling me that I needed to get down to Dominic’s Tavern in Bellmawr. And when a suggestion comes in (or in this case a multitude of suggestions from Dan, Michele, Marty, and Mark to name a few), I make sure I answer that call. So I grabbed some friends and headed down to Dominic’s to try them out for myself. We got down there on a Friday night and the place was packed. Everyone was having a great time around the bar, and the people seated in the dining area were all involved in a game of “Trivia” with the DJ. It was pretty interesting and consisted of Name that Tune, Movie Trivia, and Word Puzzles all wrapped up into one happening game that got the crowd going. These were good people having a great time, and it wasn’t long before these friendly regulars welcomed us into their world with open arms (shout out to Al and Kathy). And if that’s all I was after I would be set, but I came for the wings and it couldn’t have been better timing ’cause I sure was hungry. The wings are offered with the standard Mild, Medium, and Hot, but also come with a super hot version called 911 and a unique blend known as “Fat Daddy” which is exclusive to Dominic’s. The locals here swear by it and insisted that I get some to try out. With that in mind, I ordered my 10 wings in Hot with some of the “Fat Daddy” and 911 sauces on the side. Pair that with some french fries and a bucket of beer, and you have the makings for a good time. The wings came out rather quickly and smelled delicious. They were a decent size and lightly breaded, but here is the interesting thing… the chefs didn’t toss the breaded wings in the sauce. Instead, they pooled the sauce on the bottom of the dish and rested the wings on top. I only assume that this was to prevent the wings from getting soggy which was a GREAT idea, and yet there was plenty of the sauce to drown the wings if you so desire (which I do). The meat of the wings could’ve been a bit more tender, but all of that was forgotten when I rolled them in the sauce and took my first bite. The sauce here had amazing flavor. I could taste the Buffalo flavor that I crave mixed in with a bit of sugary sweetness that kept me going for the next wing, and the next, and the next. Though the heat levels were a bit misleading (my hot was more of a medium), it was the exact amount of heat that I enjoy. 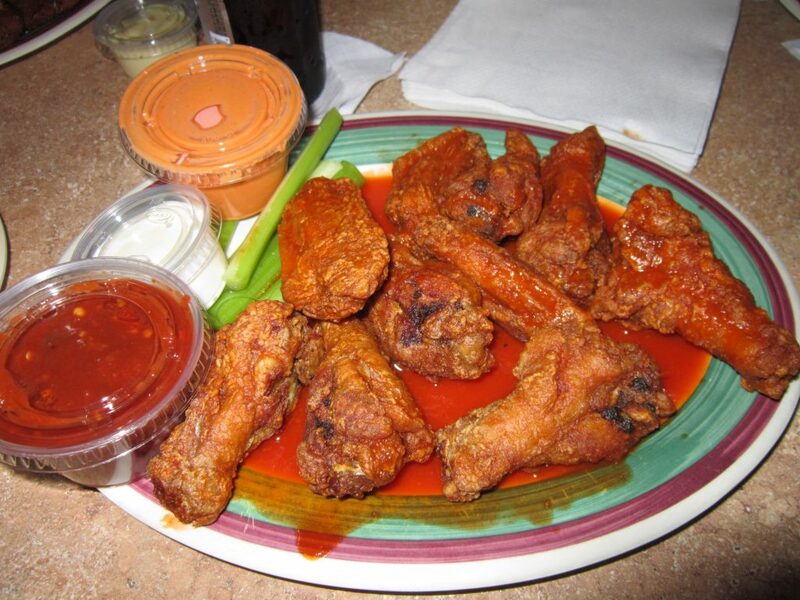 Not too hot, but enough kick to remind me that they are not just wings… they are Hot Wings! I finished up all but two and was ready to sample the other sauces. The 911 followed the same heat level issue since it was not as incredibly hot as I was led to believe. But that’s not necessarily a bad thing because I often wonder why anyone would want to eat these supremely hot sauces except on a dare. After a certain heat level, you can no longer taste your food, just the sensation of HOT. But with Dominic’s 911, the heat was actually bearable, and with the awesome flavors I got from the minced peppers that were sprinkled inside, made me see that this dish could actually be eaten and enjoyed as a meal… not just a dare. The “Fat Daddy” sauce was next, and I was ready to see what all the fuss was about. So I took this orange-colored mixture (comprised of ranch, cheddar, and hot sauce), poured it all over my last wing, and went to town. It was definitely a different taste than I was used to and wasn’t half bad. The sauce still had some heat and the taste of cheddar was pretty predominant. But, if I had to choose between the “Fat Daddy” and the regular Hot sauce, the regular Hot sauce would win every time. All in all, Dominic’s Tavern offered up a ton of pleasantries. Not only was this local bar a happening joint with great people and polite staff, but the wings they serve are freakin’ awesome! With a crispy skin and practically perfect sauce, how could they NOT be?! I recommend that if you are ever in the Bellmawr area, make sure to take a detour into this pub to pick up some for yourself. You will not be sorry that you did.